This article analyzes the pressure of farming on tropical forests in eighteenth- and nineteenth-century Brazil. Making use of GIS technology, it was possible to create a map for the South Central of the Minas Gerais province and geocode historical data for agriculture and livestock production. We have found an association between corn and swine production in areas of forest, and we suggest a correlation of the practices of slash-and-burn agriculture, pig raising, and foodstuff marketing to the clearing of forested land. This article stems from an initial desire to utilize Geographic Information System (GIS) to assess the deforestation that consumed the original forest that covered most of the eastern part of Brazil before the arrival of Europeans. The Atlantic Forest stretched along the Atlantic coastline from the equator to the southern tip of Brazil, extending inland into what are now the states of Minas Gerais, São Paulo, Paraná, and Santa Catarina, reaching eastern Paraguay and the northeast of Argentina. From the sixteenth to the nineteenth century, the Atlantic Forest biome was the locus of the three most important economic activities in Brazil: the sugarcane plantations of the northeast, the gold mining of Minas Gerais, and the coffee plantations of Rio de Janeiro and São Paulo. In the twentieth century, most of the Brazilian industrialization occurred in the formerly forested southeast portion of the country, and in the beginning of the twenty-first century, approximately 70 percent of the Brazilian population, or 133 million people, live in areas that were originally covered by the Atlantic Forest. In the present day, less than 8 percent of the forest remains in scattered fragments present in Brazil, Argentina, and Paraguay. The Atlantic Forest’s long history of destruction was recorded in the written works of scientists, travelers, businessmen, and government officials. Several eighteenth and nineteenth-century chroniclers criticized the slash-and-burn methods of agriculture as a senseless destruction of a forest that was seen both as an economic asset to be used in a rational manner and as a locus of enlightened scientific inquiries. Based on these accounts, contemporary scholars affirmed that, prior to the twentieth century, the slash-and-burn agriculture practiced in Brazil had caused the biggest part of the destruction of the Atlantic Forest. This technique, known in Brazil as coivara, was the main method of agriculture in the country since colonial times — European settlers inherited it from the indigenous peoples. Pre-Columbian crops like beans, manioc, squash, and corn were also part of the inherited agricultural complex that allowed the Portuguese to survive in the new lands. In a situation of abundance of land and scarcity of labor, it made sense for Portuguese settlers to abandon the plow in favor of a type of agriculture that required less hours of work and made the riches and fertility of the forest available through fire. The negative view of slash-and-burn agriculture is not restricted to the case of the Atlantic Forest in Brazil, as for decades, slash-and-burn agriculture has been seen as a major cause of deforestation in tropical regions throughout the world. Yet, in recent years many researchers have been challenging this view, proposing new perspectives that complicate a rather simplistic history of deforestation. First, there is the critique of the idea of immaculateness frequently applied to pre-Columbian forests. William Denevan argues that the idea of a “virgin forest” cleared by slash-and-burn agriculture requires the belief in the “pristine myth” of the existence of prior landscapes without humans. In fact, this is a questionable view of the past landscape of the tropics, as historical and archeological evidence show that tropical forests have coexisted for millennia with humans practicing slash-and-burn agriculture. In the case of the neighboring Amazon forest, recent archaeological findings have shown that pre-Columbian populations had a long history of forest management, and that the contemporary clusters of fruit, nut, and rubber trees in the midst of the forest are the result of generations of human action. Therefore, even the primary forests should be considered anthropogenic to a certain degree. According to Angelsen, traditional slash-and-burn agriculture is not the main cause of deforestation because, in general, this process clears only secondary forests, which had originated from an earlier process of slash-and-burn cultivation. In the new cycle the fields are, in turn, left fallow to recover into secondary forest again and the loss of forest area is lessened in the long run. This new approach to slash and burn complicates traditional views of the impact of some types of agriculture on the Atlantic Forest biome. On the one hand, one ought to discard the idea that, a priori, the coivara, the native Brazilian slash and burn technique, would invariably led to the continuous transformation of forests into agricultural land. By comparing accounts of foreign travelers and colonial officials, Marcos Lobato Martins, points out that, in eighteenth-century central and southern Minas Gerais, “environmental disorder” had not taken the “catastrophic dimensions” present in the neighboring captaincy of Goiás. On the other hand, hindsight shows the forest, indeed, has almost been totally cleared. Yet, in the case of South Central Minas Gerais, it is hard to understand exactly how and when deforestation happened. By avoiding simplistic assumptions about the nature of agriculturally backward technologies, it is posible to reconstruct a more complicated image of what happened. This new approach suggests that factors external to the logic of indigenous coivara (like food prices, association with swine production, pressure of livestock ranching, or population growth) acted to transform the cleaning of land into a phenomenon with permanent effects, converting secondary forest into farmland while driving farmers to remaining areas of primary forest. However, it is difficult to capture this transformation with the incomplete data available for eighteenth and nineteenth century Brazil. Obviously, quantitative measurements of deforestation were never performed in historic Brazil, and the only option to assess the phenomenon is to indirectly approach the question through a proxy. Since data on agriculture and livestock are available for historic South Central Minas Gerais, I decided to use animal husbandry in forested areas as a substitute for actual deforestation. Livestock land use provides a feasible index of deforestation, for cattle ranching requires a more perennial transformation of forest into farmland when compared to slash-and-burn agriculture. In the beginning of the nineteenth century, the eastern fringes of the captaincy of Minas Gerais were still densely forested. Throughout the eighteenth century colonial administrators had maintained a ban on settlements in this area, which kept the area sparsely populated. Their objective was to avoid gold and diamond smuggling by maintaining the mining region to the west isolated from the densely populated Atlantic board while controlling the two official southern routes to the coast. The ban created a north-south buffer zone populated by semi-nomadic “ferocious” indigenous peoples that helped to isolate the mining country to the west from the eastern seaboard to the east. Located to the west of the forests, the mining core of the captaincy was, on the other hand, much less forested and devoid of indigenous populations — a consequence of a century-old colonization process. Settlement, however, did not entirely convert forest into fields and pastures, as gold and diamond mining, in the way it was practiced in eighteenth-century Brazil, exerted a minor impact on the forests when compared to farming. In addition to that, at the height of the mining cycle much of the provisions that suplied the minining society were produced other regions, particularly the neighboring captaincy of São Paulo. By 1810 the mining region still presented vast areas of primary and secondary forests, as attested by several historical accounts. The impact of farming on forest cover in the central mining region of Minas Gerais has not been studied to date. Therefore, this study assesses the land use and the spatial narratives of deforestation in Rio das Mortes, a section of the mining region that quickly switched to crop production and cattle ranching after the decline in gold production. Rio das Mortes was one of the regions forming the original core of the eighteenth-century colonization in Minas Gerais and provides a perfect case for the study of the pressure of agriculture and livestock in areas of Atlantic Forest. Following the decline of gold output in the second half of the eighteenth century, the Rio das Mortes region was among the first to switch its economy from gold mining to food production. The Rio das Mortes region was one the comarcas of Minas Gerais captaincy. In colonial Brazil, a comarca was the main subdivision within each captaincy. In the case of eighteenth-century Minas Gerais, the captaincy was divided into four comarcas: Serro Frio, Sabará, Villa Rica, and Rio das Mortes. These comarcas were subdivided into municipalities (termos) that usually comprised a great area of several thousand square kilometers dotted with small villages. In colonial times, Rio das Mortes was divided into two municipalities: São João del Rei and São José del Rei. The towns that served as the seat for these municipalities were located a short distance from each other, but the entire areas of their municipalities spread out dividing the comarca into a northern and southern half. 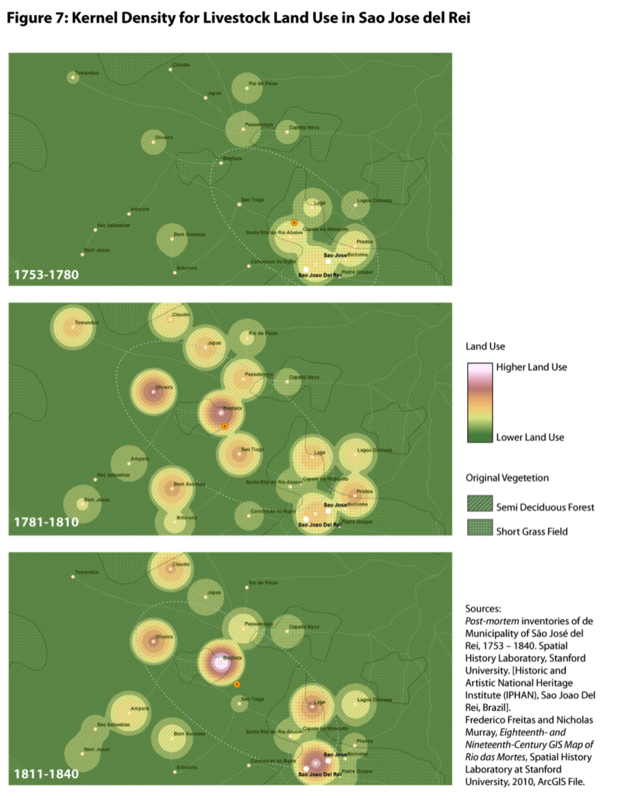 This paper uses data for farms in the northern municipality, São José, to assess the pressure of slash-and-burn agriculture and livestock on areas of Atlantic Forest in the eighteenth and nineteenth centuries. The primary sources for this article are 317 post-mortem inventories from the municipality of São José del Rey collected by Afonso de Alencastro Graça Filho. 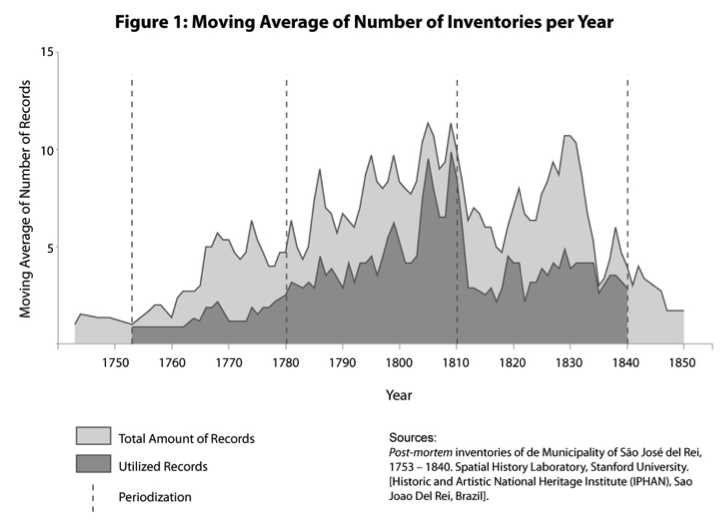 These inventories were selected from a larger pool comprising 561 inventories for the same municipality, spanning from 1743 to 1850. The chosen inventories were those identified with locations in an 1862 map of the province of Minas Gerais. Those inventories marked generically as “São José” were excluded from the pool of observations as they could be located anywhere within the area of the municipality. Also were excluded those locations to the west of the São José town, like Barbacena or Lafayette, as these locations are only mentioned in those records from the mid eighteenth century. The remaining inventories were divided into three periods of approximately 30 years. The first period, from 1753 to 1780, contains 36 observations; the second, from 1781 to 1810, comprises 164 inventories; and the final period, spanning from 1811 to 1840, is composed of 117 inventories. Together, these periods represent the end of colonial Brazil and the first decades of the independent Brazilian empire. Figure 1 shows the moving average of the number of records in each period. 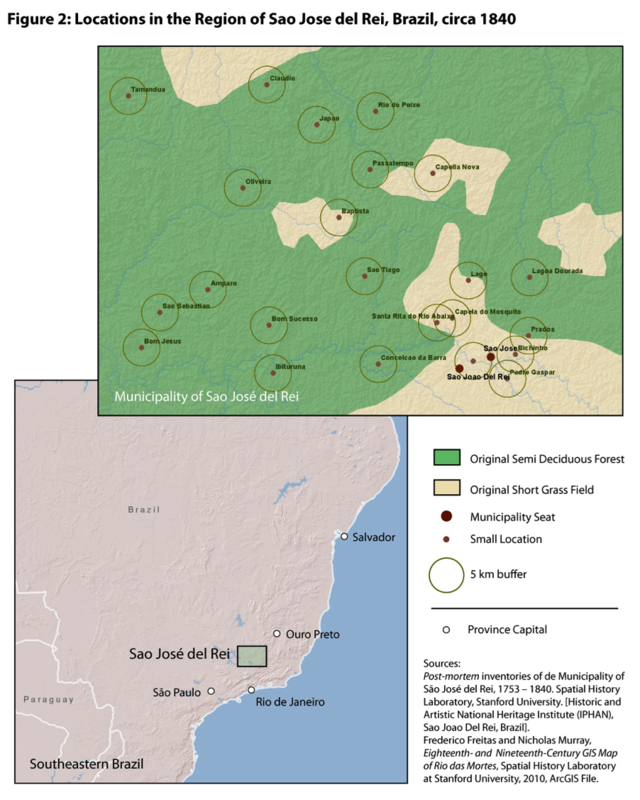 Figure 2 shows the map of the region of São José del Rei and its location in the southeastern part of Brazil. To geocode each of the 317 selected inventories to a spatial location, a GIS map for the entire Comarca of Rio das Mortes was produced based on both the aforementioned 1862 map and another one from 1778. 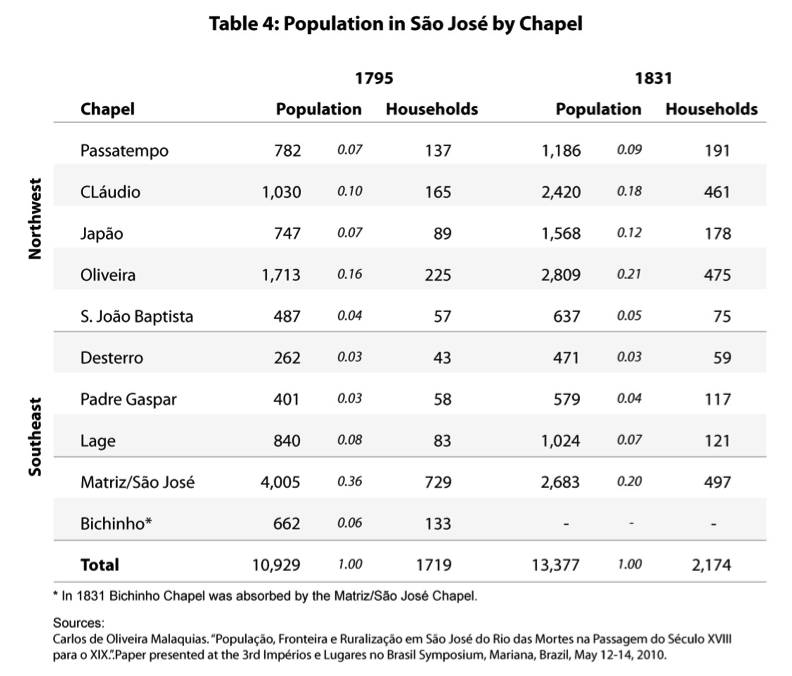 In total, 105 locations were identified and geocoded in the Rio das Mortes region, ranging from important towns like São José and São João to small villages comprising a chapel and a couple of houses. 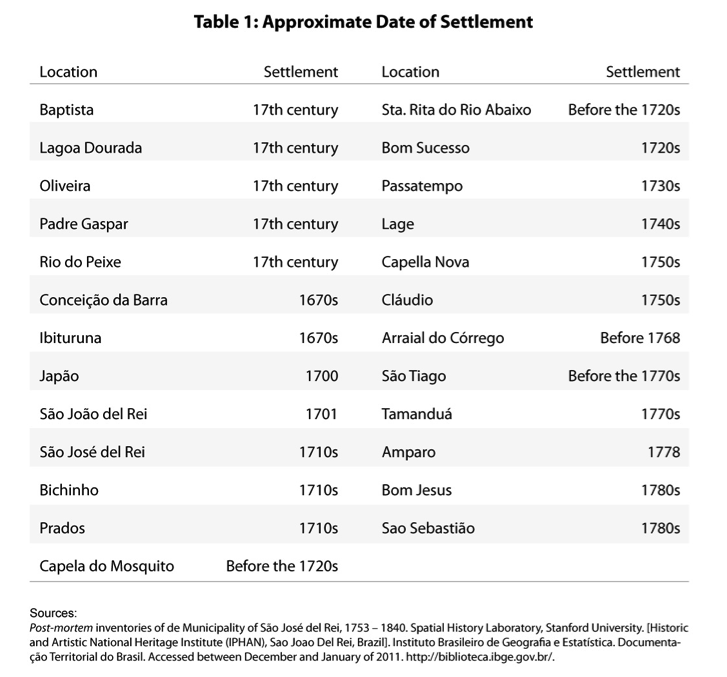 From these, 24 locations were mentioned in the São José inventories; these are depicted in Figure 2. The first step to determine the exact point for each location in the GIS map was to relate the names of places featured in the 1862 map to twenty-first century cities, towns and villages. Next, coordinates for the contemporary places were found with the help of Google Earth and were then input into the GIS map, where they were named after the locations in the nineteenth-century map. This method allowed for the mapping of small villages in eighteenth- and nineteenth-century Rio das Mortes, but it did not reveal the actual locations of the farms registered in the inventories. Therefore, it was assumed for this study that the farms could be located anywhere within a five-kilometers buffer zone from each identified location. Historical research based on estate inventories presents challenges that, for this present study, should be addressed in the form of two preliminary caveats. First, there is the problem of the representation of the whole universe of possible observations within each period. The 317 inventories used in this study are not a survey of all the potential observations; ­they only record the estate of those who died in each given year. Furthermore, they register only those decedents whose estate was inventoried, and it is reasonable to assume that not all the deceased wealth holders had their estate being inventoried after they passed away. There is not a precise way to know the proportion of estates that were inventoried, nor how representative is the fraction of deceased wealth holders in the universe of all living farmers for each given year. Another problem is that of the representation of the farm’s assets and production within each inventory. The moment captured by an inventory is a random one — it does not register the whole production of a farm in a given year, but only the production in the particular moment that the inventory was produced. It could happen that in the week the assets were inventoried, all the harvested crops, or a great number of pigs, had just been sold in the market. Conversely, an inventory could also capture the subsequent moment after the harvest, when the storehouses were full of corn. In the former case, smaller figures for crops and livestock would be recorded in the inventory than in the latter. Therefore, there is no way to know how accurate are the data coming from inventories in terms of the universe of each farm. It is also impossible to assess how consistent the data from an individual farm is to all the farms within a region. By summing up inventories in long periods of three decades each it is possible to mitigate some of this uncertainty, but one has to keep in mind that this kind of source represents only a imprecise sample of the whole universe of occurrences, and when they are used in this manner, they might only allow for the identification of loose trends and patterns within extensive periods of time. In the case of farm owners, each record provides the amount of crops and livestock registered in the inventory. Originally these numbers were recorded in different units of weight, volume, area, and length. Prior to the spatial analysis performed in this research, these numbers were all converted into square meters through the calculation of the area of land required to grow the different kinds of crops or raise the particular types of livestock present in the inventories. Figure 3 shows the summed land use of all the 24 locations within the municipality of São José. The figure reveals that livestock required a greater extent of land than agriculture. Whereas livestock demanded a minimum of 129 million m2 in this period, agricultural land use accounted for between 2 and 6 million m2. Indeed, livestock generally appears as using ten times more land than agriculture. By the early nineteenth century, farms in the Rio das Mortes region, specially those in its southern half dominated by an abundance of natural fields, provided livestock-based goods, especially cheese and bacon, to urban markets like the old mining settlements of São João del Rei and Vila Rica, and to a lesser extent to Brasil’s capital city Rio de Janeiro. Also, cattle ranching in South Central Minas Gerais was a notoriously low-yielding enterprise. However, the relation between agricultural and livestock land use can be misleading, given the fact that a slash-and-burn agricultural system under the pressure of production for urban markets would augment considerably its demand for new lands. Slash-and-burn agriculture is a type of shifting cultivation that consists in cutting the trees of a given area and burning the remaining biomass to produce a field of ashes where the planting of crops occurs. After the harvest, the cultivated area is left fallow for the time necessary to recover soil fertility. Depending on the region, this period can vary from 2 to 100 years. In areas of tropical semideciduous forest in Minas Gerais, the fallow period traditionally lasted about 20 and 30 years. In tropical areas, it is common that an area be left fallow until a secondary forest establishes itself where once there was cultivated land. The cycle consisting of cultivation and fallow is of crucial importance to this type of farming, and it tends to maintain the overall long-term use of new lands in equilibrium, as after years of fallow farmers tend to come back to areas of recovered forest, thus sparing the primary forest. In areas with increasing pressure from urban markets or significant increment on population, this equilibrium tends to be broken as farmers return to fallow lands in a faster pace. This increases demand for new lands and leads farmers to move into areas that were not being used for agriculture before. In these cases, forested areas end up being cleared definitively since their cycle of nutrients based on forest coverage is exhausted in a matter of few years. For the purposes of this study, the calculation of land use shown in Figure 3 should be seen as relative. It is a way to compare, within each category, the change in land use in relation to space and time. Over the first two periods, from 1753-1780 to 1781-1810, the land use for agriculture increased 222%, while the land use for livestock grew 528%. The passage from the second period, 1781-1810, to the third one, 1810-1840, shows a reduction of 62% in agricultural land use, and of 17% in the use of land for raising livestock. Given the general weight of livestock land use in our calculations, the sum of livestock and agriculture (all use) shows basically the same temporal relation depicted in the panel for livestock in Figure 3. Moreover, the three periods reveal three different contexts. In the first period, gold production in the captaincy of Minas Gerais had already reached its apex, but it was yet to reach the bottom levels of the end of the eighteenth century. Farming in the Rio das Mortes region was being established, and one had to wait until the end of the eighteenth century to see its boom. In the second period, the population growth that resulted in part from the influx into the region of people from the neighboring comarcas might have influenced the increase in land use in both categories. Between 1776 and 1808 the population of Rio das Mortes grew at the rate of 2 percent annually. At the same time the neighboring comarca of Vila Rica, once the wealthiest and most populous region of the captaincy of Minas Gerais, was loosing its residents at a rate of 0.3 percent annually, as a result of the decline of mining in the region. A reduction in farming and ranching occurred in the third period, despite the possible effects that the establishment of the Portuguese court in Rio de Janeiro in 1808 might have had in creating demand for value-added animal products like bacon and cheese from Minas Gerais. The development of a consumer market with more sophisticated tastes in Rio was pointed by Linhares as a cause for a boom in agriculture and livestock in Minas Gerais, but it is important to note that the new demand for foodstuffs did not evenly affect the entire captaincy. Southern Minas Gerais, located outside the study area, was the region that benefit the most from the new demand created by the Portuguese nobility settled in Rio de Janeiro, as it was the closest mineiro region to Brazil’s capital. In the old mining core, particularly in São José del Rey, the arrival of the Portuguese court in Rio had little effect in stimulating a boom in agriculture and livestock. In fact, for the neighboring municipality of São João del Rei, also part of the comarca of Rio das Mortes, Graça Filho identifies a context of economic depression between 1814 and 1829. It was during these years that the decline in mining was felt most harshly in the comarca. Adding to that, between 1814 and 1819 the region was castigated by a severe drought that resulted in the reduction on the number of cattle, a widespread famine throughout the comarca, and a decline in farming activities. From 1829 to 1834 an epidemic devastated the cattle, causing considerable shrinking in the number of heads. Nevertheless, even with the general decline in farming and ranching in the third period, it is possible to identify a continuous shift from agriculture to livestock production in the region from the 1750s to the 1840s. 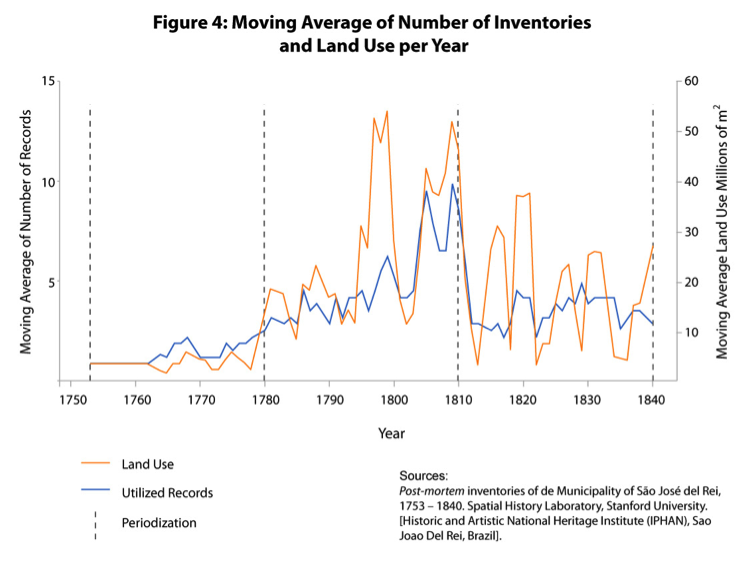 That is revealed when the moving average number of inventories is contrasted to the land use in the three periods. Figure 4 shows an increase in land use (orange line) in the seconds and third periods when compared to the number of records (blue line). This suggests that, despite the general crisis in the third period, more forested land was being converted to pastures as the nineteenth century went on. Figure 5 (p. 21) is composed of three panels depicting the spatial density of all land use among the 24 locations in São José for each period. In the first panel, 1753-1780, land use is concentrated in the rectangle formed by Prados, Arraial do Corrégo, Santa Rita do Rio Abaixo, and Lage. These locations are part of the original core of the comarca, near the main towns of São José and São João. In the first period, the greater share of agricultural activity in the municipality was concentrated in areas of natural short grass fields, represented with the overlaid dotted pattern. These areas were characterized by grazing in higher grounds and some slash-and-burn cultivation in the low-land riverine forests crossing these natural fields. In the remaining area, there was a less accentuated agricultural and livestock activity. The orange dot between Santa Rita do Rio Abaixo and Lage marks the mean point of all the locations weighted by land use, and gives a sense of the change in the spatial distribution of farming and ranching between the periods. In the first panel, the mean point is located in the southeastern corner of the municipality, near the towns of São José and São João, the initial colonization focus of Rio das Mortes. The second panel shows a clear spread in the use of land throughout the region. The mean center moved to the center of the region, near Baptista, which is the village presenting the higher concentration of land use. That might suggest the process of colonization onto new lands — the result of new migrants moving into the region and establishing new farms. Although Baptista, the location with the highest activity, is located in an area of natural fields, most of the other locations are in areas of original tropical semideciduous forest , indicating growth in the clearing of land in the region. 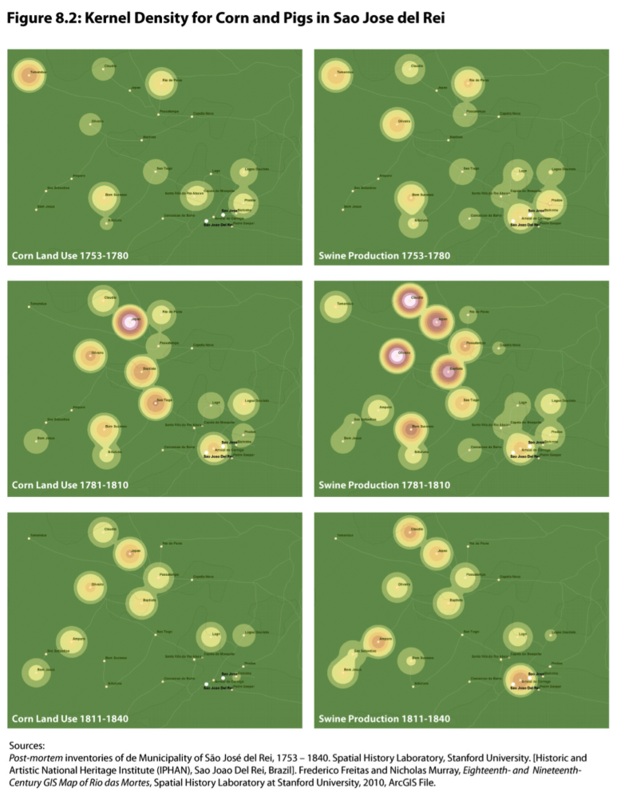 The bottom panel shows the land use for the last period, 1811-1840. Here, the aforementioned crisis of 1814-1834 is evident. While the mean center remained roughly in the same place, it suggests that the process of spatial expansion to new locations in the municipality had achieved its maximum point, the intensity of land use had decreased in most peripheral locations, like Tamanduá, and Rio do Peixe. Baptista consolidated itself as the center for land use, showing the highest density among the different locations in all the three periods. The panels in Figure 7 (p. 23) shows the land use only for livestock. 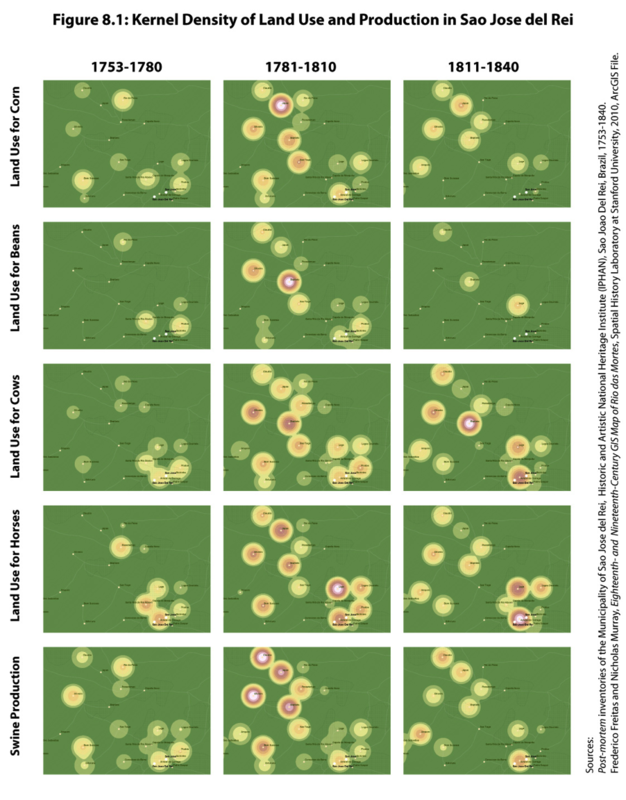 The concentrations are almost identical to the aggregated land use in Figure 3, this is expected given the weight of livestock land use when compared to agriculture. The 1781-1810 panel for agriculture shows the increase in land use for crops that is concomitant to the expansion of livestock. However, in this case the land use is less equally distributed, and the area with the biggest concentration is located around the village of Japão, at the heart of a region of forests. Baptista, situated at the border of a forest and natural field area, also shows a high presence of agricultural activities. The region around the most populous centers, São José and São João, shows lower density of farming, that might indicate both the natural vocation of an area of natural fields for livestock and the effects of older colonization, which in terms of slash-and-burn techniques means less forested areas for agriculture. The third panel, 1811-1840, shows a similar spatial distribution of agricultural activities, but with an overall lower density, reflecting the crisis and drought that occurred during these years. The polygon formed by Santa Rita, Arraial do Córrego and Prados did not register any agricultural activity. In 1817, the year of the drought, two European travelers described the desolation they found in this area. Traveling from São João to Santa Rita, Pohl depicted a barren and sterile landscape, with extensive treeless fields that happened to be burning at the time due to “the local custom of using fire to remove insects and renew the fields.” In the northern side of the São José Mountains, between Arraial do Córrego, and Prados, Martius reported the predominance of dry fields without plantations of any sort. In sum, these figures show the evolution of agriculture in this region: from the initial phase of agriculture production in forested areas, to the intermediate stage of expansion of agriculture into most of the central locations, to the final period of agricultural retraction. 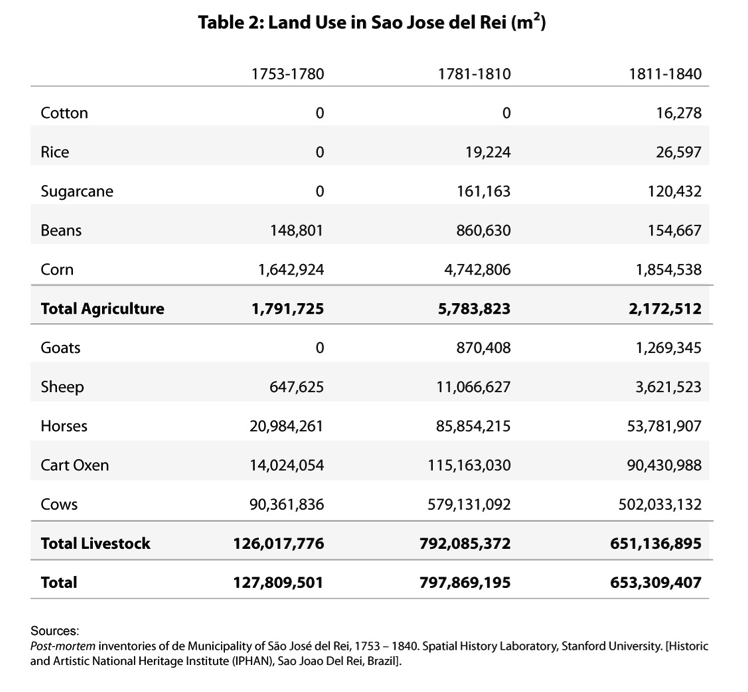 Table 2 shows land use in the municipality of São José del Rei for each category of crops (cotton, rice, sugarcane, beans, and corn), and livestock (goats, sheep, horses, cart oxen, and cows). Some crops, like manioc and castor oil plant, are absent from this table because their presence is insignificant in the inventories. Although manioc was the main staple food in colonial Brazil, its use was uncommon in South Central Minas Gerais. Indeed, Buarque de Hollanda had coined the term “corn civilization” to refer to those inland areas of Minas Gerais and São Paulo, where the use of corn as staple food surpassed manioc. Linhares divides the Brazilian territory into three areas, attributing to each a different indigenous agricultural complex that was inherited by the subsequent colonial populations. In an area extending from the Amazon basin to the arid lands of the northeast to the lowland Atlantic fringes down to the São Paulo coast, the main crop was manioc. Corn was the staple food for the Guarani and Gê populations of the highlands of southeastern Brazil. Sweet potatoes were the main crop among the peoples living in the savannas that occupy most of central Brazil. In the eighteenth and early nineteenth century, this spatial division between corn and manioc areas still existed, and it reflected the weight of the indigenous agricultural techniques and cultural norms in the colonial population until that date. In terms of livestock, pigs are absent from the calculation of land use due to the fact that swine production was associated with corn — a greater part of the harvested corn would end up feeding the pigs. As shown in Table 2, corn had the biggest share of agricultural land in the three periods; first, with 91 percent of all the agricultural land use, than, with 81 and 68 percent respectively. Beans came in second, with 8, 14 and 7 percent for each period. The difference between corn and beans is explained by the fact that beans were grown exclusively for human consumption, while corn served as food for humans and pigs alike. The table also shows the growth in the variety of crops across the periods, with sugarcane and rice becoming important in the end of the eighteenth century. For livestock land use, cows are the group with the biggest share of land use, representing a slight increment in the percentage of land use throughout the three periods: 71, 73 and 77 percent of all land used for livestock was occupied by cows. If we consider corn as a proxy for swine land use, we can infer that even with the population growth and the increased human demand for corn it generated, at the end of our period cows had increased their use of land at a higher rate than pigs. This might be an effect of more cleared land available in the mid nineteenth century. We will revisit this issue later. Finally, raising goats is the only type of land use that had grown between the periods of 1781-1810 and 1811-1840. This was accompanied by the fall in the use of land by sheep. That could be explained by a possible farmers’ leaning to switch from sheep to goats in times of severe drought, given the fact that goats in Brazil are traditionally raised in arid and harsh climates, especially in the northeast of the country. Figure 8.1 (p. 29) shows the spatial density and land use in five categories; corn, beans, horses, cows, pigs. By comparing the panels for corn and beans for the period of 1743-1780, it is possible to perceive that corn was the main crop being raised in the peripheral locations in areas of forest. After that, corn and beans become equally widespread throughout the municipality of São José and in the final period of 1811-1840, beans seems to had suffered more the impact of the crisis and drought, as it is absent from most of the locations of the previous period. Due to its association to swine production, corn was a more profitable culture than beans, as the latter was related to subsistence agriculture. Spatially, this difference between the two crops brings to light to the crucial role played by the association of corn and swine production to regional markets as a spearhead for the occupation of land. The total area for the São José region in the nineteenth century is calculated through the polygon formed by the locations identified in the inventories; it comprises approximately 13,200 km2. By using georeferenced information for both the original areas of tropical semideciduous forest and the remaining forested areas in 2008, it is possible to have a sense of the amount of deforestation that has occurred from the beginning of Portuguese colonization to today. The 2004 Brazilian Vegetation Map produced by the Brazilian Institute of Geography and Statistics (IBGE) estimates the areas for different types of vegetation at the time the first Portuguese settlers arrived in the Brazilian coast. The overlaying of this map on the GIS map of the comarca do Rio das Mortes provided an estimation of the original area of tropical semideciduous forest for São José del Rei. Approximately 10,100 km2 in that municipality were covered by original forest before the beginning of the colonization in the region in the eighteenth century. This means that 76 percent of the total area was covered by forest and 24 percent by natural fields. Another map produced by the SOS Atlantic Forest Foundation (Fundação SOS Mata Atlântica) provides the area of the remaining original vegetation in areas of Atlantic Forest throughout the eastern fringe of Brazil. In the case of the historical region of São José del Rei, less than 650 km2 of forest remained by the year 2008. This represents roughly 4 percent of the total area of historical São José, or around 6 percent of the original area of tropical semideciduous forest. 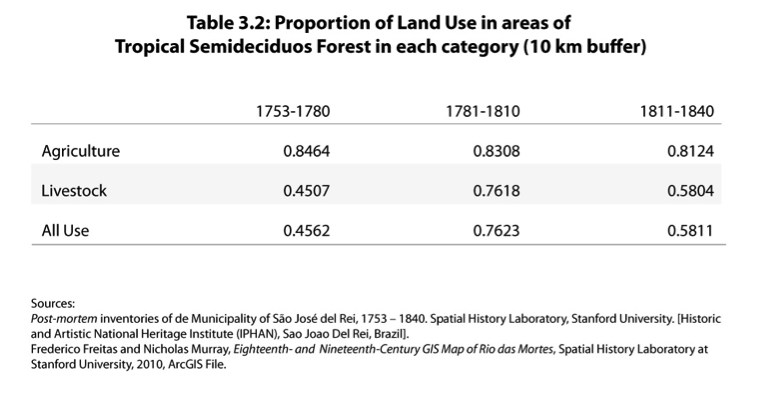 Table 3.1 shows the proportion of land use in areas of tropical semideciduous forest for the three periods. The numbers are based on the proportion of originally forested land within a five-kilometer buffer around each location. As mentioned before in this paper, we assumed the land use was evenly distributed inside these buffers. According to these estimations, in 1753-1780, 84 percent of the agricultural land use were on forest areas, while for livestock, the proportion is much lower — 41 percent. This gives support to the hypothesis that agriculture is responsible for the greater share of the clearing of land. In the second period, the proportion of agriculture land use in areas of forest remains roughly the same, 78 percent, but livestock now shows a much higher incidence inside the area of forest — 72 percent of all the livestock land use was occurring on former forested lands. Table 3.2 shows the same proportion of land use in areas of forest, but now within a 10 km buffer. The results are similar to the ones obtained with 5 km buffers, which gives support to the initial choice of a 5 km area of analysis around each location. A mechanism of occupation of new lands seems to be working in the second period; as forested land was cleared by the association of corn and pigs, cows moved in and helped to transform former forested areas into fields. The final period presents an inversion of this trend, as livestock seemed to recedes to the intermediary proportion of 50 percent of land use on forest areas. By dividing the inventories into two periods instead of three, the shrinkage of land use in forested areas becomes clearer. 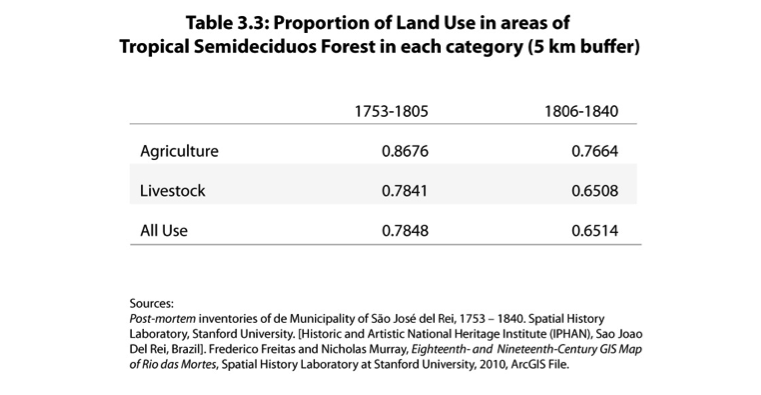 Table 3.3 shows that, between the periods of 1753-1805 and 1806-1840, land use in forest area decreased around 10 percent for agriculture and 13 percent for livestock. That might be a result of the drought and epidemics occurring in this period, or an overall trend of economic declining in São José del Rei that was reflected in the capacity of transforming primary and secondary forest into pastures and agriculture land. Unfortunately we do not have enough information to infer in depth the causes for this inversion trend. We could also say that the deforestation occurred in cycles of intensification and receding of land use. 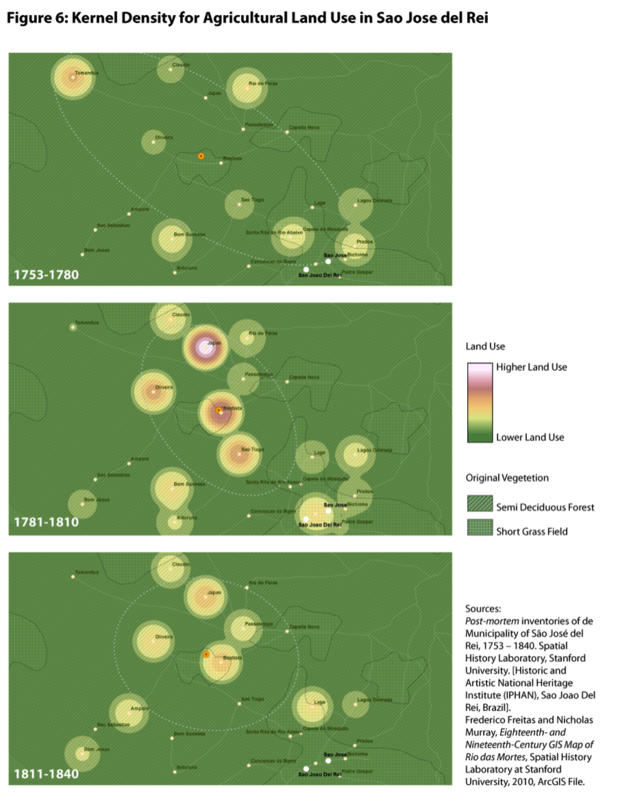 Given the available sources, it is not possible to know whether crises like the one between 1814-1834 allowed for a pause in land use pressure on forest and for the regeneration of vegetation in cleared areas. Yet, through contemporary accounts it is possible to have a sense of how much of the forest had been destroyed by agriculture in the early decades of the nineteenth century. In 1819, the French naturalist Auguste de Saint-Hilaire traveled through the region between the town of São João del Rei and the village of Tamanduá. His description of the landscape serves as a testimony of the state of deforestation in the region of São José after the period of livestock expansion registered between 1780 and 1810. According to Saint-Hillaire, this whole region presented both fields and forests. Near the town of São João del Rei the landscape was dominated by small hills and bush vegetation. Many farms were located in the bottom of valleys, where gold mining was still being practiced. In the central region between Conceição da Barra and Oliveira original forests had been cut but had not yet been replaced by pastures, as significant portions of this area were, by then, mostly covered by regenerating secondary forests. The area in the northeast of the municipality was hilly country, and it was also more forested that the previous ones. Saint-Hillaire actually describes a “real forest” existing in the eastern outskirts of the village of Tamanduá, probably a primary forest. Corn and pigs were present in most of the secondary forest areas throughout this region, and the canastra pig was considered the main form of wealth. Pigs were not raised in confinement, and were free to roam wherever they wanted. They were fed twice a day with corn and would starve to death whenever corn was not available. When fattened, a pig would weight 88 kg, and would be sold and taken alive in herds to Rio de Janeiro, more than 350 km away. The spatial analysis of the land use in the comarca of Rio das Mortes reveals how deforestation occurred. In the frontier areas of tropical forest the technique of coivara, borrowed from the indigenous peoples along with the corn and bean cultivation, was associated with old world crops and animals like rice, pigs, cattle, and probably chicken (they are absent of the inventories, but historical accounts report them as widespread). On the frontier, the association between corn and pigs was responsible for most of the land use in forest zones. Population growth, market demand from local urban centers, and the association of corn to swine raising accounted for the direct pressure on the forest posed by slash-and-burn agriculture in this period. In contrast the slash-and-burn cultivation practiced by indigenous peoples and isolated colonial farmers in the past might have exerted only limited pressure on the forest. The long-lasting swath of forested areas inhabited by indigenous peoples in the neighboring regions of eastern Minas Gerais attests the milder pressure slash and burn exerted on forest when it was practiced outside of a context of market production and demographic growth. A more detailed analysis of agricultural practices in this period underscores the perils of reducing the complex set of entangled factors behind the destruction of the forest to one single cause. What European travelers saw contemptuously as a backward and destructive method of farming practiced by primitive Brazilian farmers was in fact, just one element in the equation of deforestation. Post-mortem inventories of de Municipality of São José del Rei, 1753 – 1840. Spatial History Laboratory, Stanford University. [Historic and Artistic National Heritage Institute (IPHAN), Sao Joao Del Rei, Brazil]. Couto, José Vieira, and Júnia Ferreira Furtado. Memória Sobre a Capitania das Minas Gerais: seu Território, Clima e Produções Metálicas. Belo Horizonte: Fundação João Pinheiro, Centro de Estudos Históricos e Culturais, 1994. Eschwege, Wilhelm Ludwig von, Friedrich E. Renger, and Douglas Cole Libby. Jornal do Brasil, 1811-1817. Belo Horizonte: Fundação João Pinheiro, Centro de Estudos Históricos e Culturais, 2002. Halfeld, Henrique Guilherme Fernando, Johann Jakob von Tschudi, and Roberto Borges Martins. A Província Brasileira De Minas Gerais. Belo Horizonte: Fundação João Pinheiro, Centro de Estudos Históricos e Culturais, 1998. Luccock, John. Notes on Rio de Janeiro, and the Southern Parts of Brazil: Taken During a Residence of Ten Years in that Country, from 1808 to 1818. London: S. Leigh, 1820. Martius, Karl Friedrich Philipp von, A viagem de von Martius: Flora brasiliensis, vol. I. Rio de Janeiro: Editora Index, 1996. Martius, Karl Friedrich Philipp von, and Johann Baptist von Spix. Viagem Pelo Brasil. Rio de Janeiro: Imprensa Nacional, 1938. Matos, Raimundo José da Cunha, and Tarquínio J. B. de Oliveira. Corografia Histórica da Província de Minas Gerais, 1837. Belo Horizonte: Arquivo Público Mineiro, 1979-1981. Pohl, Johann Emanuel. Viagem no Interior do Brasil: Empreendida nos Anos de 1817 a 1821 e Publicada por Ordem de Sua Majestade o Imperador da Áustria Francisco Primeiro. Rio de Janeiro: Instituto Nacional do Livro, 1951. Rocha, José Joaquim da, Maria Efigênia Lage de Resende, and Rita de Cássia Marques. Geografia Histórica da Capitania de Minas Gerais: Descrição Geográfica, Topográfica, Histórica e Política da Capitania de Minas Gerais: Memória Histórica da Capitania de Minas Gerais. Belo Horizonte: Fundação João Pinheiro, Centro de Estudos Históricos e Culturais, 1995. Saint-Hilaire, Auguste de, and Afonso de E. Taunay. Segunda Viagem do Rio de Janeiro a Minas Gerais e a São Paulo (1822). São Paulo: Companhia Editora nacional, 1932. Saint-Hilaire, Auguste de, and Cláudio Ribeiro de Lessa. Viagem às Nascentes do Rio São Francisco e pela Província de Goyaz. São Paulo: Companhia Editora Nacional, 1937. Angelsen, Arild. “Shifting Cultivation and ‘Deforestation’: A Study from Indonesia.” World Development 23, no. 10 (1995): 1713-1729. Balée, William L. Advances In Historical Ecology. New York: Columbia University Press, 1998. Barbosa, Waldemar de Almeida. Dicionário Histórico-geográfico De Minas Gerais. Belo Horizonte: Editora Saterb, 1971. Cabral, Diogo de Carvalho. “Entre o Machado e o Tição: Agricutura Tropical Extensiva e Exploracão Madereira no Rio de Janeiro Colonial Tardio.” História & Perspectivas, Uberlândia (36-37): 313-362, Dec-Jan, 2007. Cristina Adams, Rui Sérgio Sereni Murrieta, Nelson Novaes Pedroso Júnior. “A Agricultura de Corte e Queima: um Sistema em Transformação.” Boletin do Museu Paraense Emílio Goeldi: Ciências Humanas, Belém, v. 3, n. 2, p. 153-174, May-Aug 2008. De Vries, Jan. “The Industrial Revolution and the Industrious Revolution.” The Journal of Economic History. Vol. 54, No. 2, Papers Presented at the Fifty-Third Annual Meeting of the Economic History Association (Jun., 1994), pp. 249-270 Published by: Cambridge University Press on behalf of the Economic History Association. Dean, Warren. With Broadax and Firebrand: The destruction of the Brazilian Atlantic Forest. Berkeley & Los Angeles, CA; London: University of California Press, 1997. Espindola, Haruf Salmen, and Gilmar Arruda. História, Natureza e Território: Coletânea de História Ambiental. Governador Valadares, Brazil: Editora Univale, 2007. Galindo Leal, Carlos, and Ibsen de Gusmão Câmara. The Atlantic Forest of South America : Biodiversity Status, Threats, and Outlook. Washington: Island Press, 2003. Graça Filho, Afonso de Alencastro. A Princesa do Oeste e o Mito da Decadência de Minas Gerais: São João Del Rei, 1831-1888. São Paulo: Annablume, 2002. Holanda, Sérgio Buarque de. Caminhos e Fronteiras. Rio de Janeiro: J. Olympio – Prolivro, 1975. Langfur, Hal. The Forbidden Lands: Colonial Identity, Frontier Violence, and the Persistence of Brazil’s Eastern Indians, 1750-1830. Stanford, CA: Stanford University Press, 2006. Libby, Douglas Cole. Transformação e Trabalho em uma Economia Escravista. São Paulo: Brasiliense, 1988. Magalhães, Sônia Maria de. A Mesa de Mariana: Produção e Consumo de Alimentos em Minas Gerais, 1750-1850. São Paulo: Annablume, 2004. Malaquias, Carlos de Oliveira. “População, Fronteira e Ruralização em São José do Rio das Mortes na Passagem do Século XVIII para o XIX.”.Paper presented at the 3rd Impérios e Lugares no Brasil Symposium, Mariana, Brazil, May 12-14, 2010. Martins, Marcos Lobato. História e Meio Ambiente. São Paulo: Faculdades Pedro Leopoldo, 2007. Munari, Lucia Chamlian, Memória Social e Ecologia Histórica: A Agricultura de Coivara das Populações Quilombolas do Vale do Ribeira e sua Relação com a Formação da Mata Atlântica Local. M.S. Dissertation. São Paulo: USP, 2009. Myllyntaus, Timo, Minna Hares, and Jan Kunnas; “Sustainability in Danger? : Slash-and-Burn Cultivation in Nineteenth-Century Finland and Twentieth-Century Southeast Asia.” Environmental History 7, no. 2 (Apr., 2002): 267-302. Neves, Eduardo Goés. Arqueologia da Amazônia. Rio de Janeiro: Jorge Zahar, 2006. Pinto, Fábio Carlos Vieira. Família Escrava Em São José Del Rei: Aspectos Demográficos e Identitários (1830-1850), M.A. Dissertation. São João del Rei, Brazil: UFSJ. 2010. Souza, Laura de Mello e. Desclassificados Do Ouro: a Pobreza Mineira no Século XVIII. Rio de Janeiro: Graal, 2004. Cândido, Antônio. Os Parceiros Do Rio Bonito : Estudo Sobre O Caipira Paulista E a Transformação Dos Seus Meios De Vida. São Paulo: Livraria Duas Cidades, 1987. Costa, Iraci del Nero, “Pesos e Medidas no Período Colonial Brasileiro: Denominações e Relações.” Boletim de História Demográfica. Year 1, n. 1. April 1994. São Paulo: FEA/USP. ———. “Cultivo do Algodão Herbáceo na Agricultura Familiar.” Brazil, February 2011. Instituto Brasileiro de Geografia e Estatística. Censo Agropecuário 2006. Brazil, 2006. Luna, Francisco Vidal, and Herbert S. Klein, “Observações sobre Preços Agrícolas em São Paulo (1798/1836).” Boletim de História Demográfica. Year 8, n. 21. March 2001. São Paulo: FEA/USP. ———. “Nota a Respeito de Medidas de Grão Utilizadas no Período Colonial e as Dificuldades para Conversão ao Sistema Métrico.” Boletim de História Demográfica. Year 8, n. 21. March 2001. São Paulo: FEA/USP. Melo, José Evando Vieira de, O Açúcar no Café: Agromanufatura Açucareira e Modernização em São Paulo (1850-1910). Ph.D. dissertation, São Paulo: USP, 2009. Quadros, Danilo Gusmão de. “Pastagens para Ovinos e Caprinos” in: Simpósio do Grupo de Estudos de Caprinos e Ovinos – Mini Curso “Pastagens para Caprinos e Ovinos.” Barreiras, Brazil: UNEB. Saint-Hilaire, Auguste de, and Leonam de Azeredo Pena. Viagens Pelo Distrito dos Diamantes e Litoral Do Brasil: Com um Resumo Histórico das Revoluções do Brasil, da Chegada de D. João VI à América à Abdicação de D. Pedro.” São Paulo [etc. ]: Companhia Editora Nacional, 1941. Vasconcellos, Paulo Mário Bacariça. Guia Prático Para o Fazendeiro. São Paulo: Nobel, 1975. The help of Nicholas Murray was essential for the completion of this article. See, Warren Dean, With Broadax and Firebrand; Johann Baptist von Spix, and Friedrich Philipp von Martius, Viagem Pelo Brasil; Karl Friedrich Philipp von Martius, A viagem de von Martius: Flora Brasiliensis; Henrique Guilherme Fernando Halfeld, and Johann Jakob von Tschudi, A Província Brasileira de Minas Gerais; Wilhelm Ludwig von Eschwege, Jornal Do Brasil, 1811-1817; John Luccock, Notes on Rio de Janeiro, and the Southern Parts of Brazil. Maria Yedda Linhares, História Agrícola, 150. Eduardo Goés Neves, Arqueologia da Amazônia. Arild Angelsen, “Shifting Cultivation and ‘Deforestation’,” 1713-14; William L. Balée, Advances In Historical Ecology; Lucia Chamlian Munari, Memória Social e Ecologia Histórica. Marcos Lobato Martins, História e Meio Ambiente, 95-6. See Hal Langfur, The Forbiden Lands, 21-53. Afonso de Alencastro Graça Filho, A Princesa do Oeste e o Mito da Decadência de Minas Gerais. Halfeld, and Tschudi, ibid. José Joaquim da Rocha, “Mapa da Comarca do Rio das Mortes – 1778,” in Geografia Histórica da Capitania de Minas Gerais. Fábio Carlos Vieira Pinto, Família Escrava em São José Del Rei: Aspectos Demográficos e Identitários (1830-1850). The locations are: Amparo, Arraial do Córrego, Baptista, Bichinho, Bom Jesus, Bom Sucesso, Capela do Mosquito, Capella Nova, Cláudio, Conceição da Barra, Ibituruna, Japão, Lage, Lagoa Dourada, Oliveira, Padre Gaspar, Passatempo, Prados, Rio de Peixe, Santa Rita do Rio Abaixo, São Sebastião, São Tiago, and Tamanduá. Halfeld, and Tschudi, “Karte der Brasilian Provinz – 1862,” in A Província Brasileira de Minas Gerais. This periodization concurs with the one proposed by Almeida in her study of the neighboring region of Mariana. According to her, the period between 1750 and 1780 was the apex of gold mining in Mariana; 1780-1810 saw the transition from a mining economy to one of subsistence farming, and in the final period, 1820-1850 the agriculture and livestock production started to be sent to distant markets. See Carla Almeida, Alterações nas unidades produtivas mineiras: Mariana (1750-1850), (Niteroi: UFF, 1994) cited by Sônia Maria de Magalhães, A Mesa de Mariana: Produção e Consumo de Alimentos em Minas Gerais, 46. Halfeld, and Tschudi, “Karte der Brasilian Provinz – 1862,” in A Província Brasileira de Minas Gerais; and José Joaquim da Rocha, “Mapa da Comarca do Rio das Mortes – 1778,” in Geografia Histórica da Capitania de Minas Gerais. The majority of locations in historical Rio das Mortes had different names in the twentieth first century. Matching eighteenth- and nineteenth-century names with contemporary ones was part of the process of geocoding these inventories. See Instituto Brasileiro de Geografia e Estatística. Documentação Territorial do Brasil; Raimundo José da Cunha Matos, and Tarquínio J. B. de Oliveira. Corografia Histórica da Província de Minas Gerais, 1837; José Joaquim da Rocha, et al. Geografia Histórica da Capitania de Minas Gerais. To calculate the required area for corn, we used the yield of 3.36 m2/kg achieved by contemporary quilombola farmers in areas of Atlantic Forest in the State of São Paulo. See Lucia Chamlian Munari, “Nélio’s Account” in Memória Social e Ecologia Histórica, 80. To calculate the required area for cows I used Warren Dean’s estimate of one head per 3.5 ha. See Warren Dean, With Broadax and Firebrand, 114. To calculate the required area for the other products I used the difference of the modern and historic yield of corn and cows as the proportion to divide the numbers of the contemporary yield beans, cotton, sugarcane, rice, goats, sheep, and horses. See Agriculture, Livestock, and Measurement References in the last page of this article. According to Eschewege, “the livestock farms are so vast and the cattle, proportionally, so few, that one could travel through miles in these farms without seen one single head of livestock.” Wilhelm Ludwig von Eschwege, Brasil, Novo Mundo, 38. See also Afonso de Alencastro Graça Filho, A Princesa do Oeste …, 118. Sônia Maria de Magalhães, A Mesa de Mariana, 50. A recent study of contemporary rural communities of descendents of slaves in the neighboring state of São Paulo shows how the pressure of the market can switch this mechanism of slash-and-burn agriculture from a situation of equilibrium to one where deforestation occurs. See Lucia Chamlian Munari, Memória Social e Ecologia Histórica. See also: Timo Myllyntaus, Minna Hares, and Jan Kunnas “Sustainability in Danger?”; and Arild Angelsen, “Shifting Cultivation and ‘Deforestation’,”1713-1729. Hal Langfur, The Forbidden Lands, 109. Maria Yedda Linhares, História da Agricultura Brasileira, 129. Douglas Cole Libby, Transformação e Trabalho, 43-5. Afonso de Alencastro Graça Filho, A Princesa do Oeste …, 182-3. Despite the local crisis in São José del Rei, the literature on provincial Minas Gerais suggests that, in the greater mining region encompassing São José, São João, Mariana, and Vila Rica, imports of slaves increased after the 1830s, when the international slave trade was officially abolished and the illegal slave trade soared. Douglas Cole Libby, Transformação e Trabalho, 56-63. These “natural short grass fields” were pockets of savanna amidst the Atlantic Forest biome where forest coverage was already absent before the European colonization as projected in Instituto Brasileiro de Geografia e Estatística, Mapas de Vegetação do Brasil 2004. 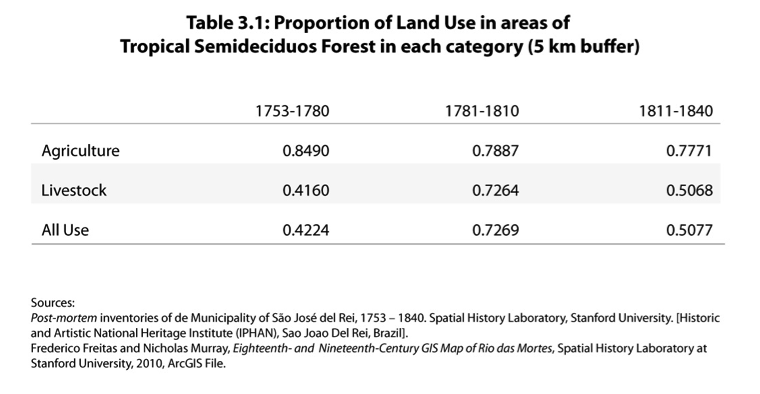 According to Dean’s estimates, most of the deforestation that occurred in southeastern Brazil during the eighteenth century was the overall result of three human activities. The first was mining, which, with its rudimentary techniques, was responsible for the destruction of 4,000 km² of forest. Livestock, in turn, was based mainly on extensive cattle ranching in natural fields and in areas already cleared for agriculture, but it also directly required the devastation of at least an additional 1,000 km² of forests. Finally agriculture, based on the traditional slash-and-burn technique, was responsible for the destruction of 22,000 km². Warren Dean, With Broadax and Firebrand, 91-116; 387 [note 48]. José Vieira Couto, Memória Sobre a Capitania das Minas Gerais, 77. See also von Martius, A viagem de von Martius: Flora brasiliensis, 76-75; Halfeld, and Tschudi, ibid., 111; Raimundo José da Cunha Matos, Corografia Histórica da Província de Minas Gerais, 1837, 235-236. Johann Emanuel Pohl, Viagem no Interior do Brasil, 216-7. Spix, and von Martius, Viagem Pelo Brasil, 295. Sérgio Buarque de Holanda, Caminhos e Fronteiras; Maria Yedda Linhares, ibid., 136-140. Raimundo José da Cunha Matos, ibid., 275. According to the IBGE, “this map represents a probable reconstruction of the vegetation types covering the Brazilian territory at the time of its discovery. The likely extent of each type, classified into phytoecological regions and areas of vegetation, was estimated based on the phytogeographic literature recognized as the most authentic and reliable, on surveys of the remnants of natural vegetation, and on field research. Measurable ecological parameters were also used, as the “dry days” isolines obtained through ombrothermic diagrams (parameters that reflect in the physiology of the plant life forms prevailing in each environment), and remote sensing data showing topography, hydrology, lithology and plant coverage. The introduction of these modern techniques of mapping has lead to what can be considered the most accurate approximation of the bygone vegetation contours of the Brazilian territory. Thus obtained, the map shows the phytoecological regions and other areas of vegetation with their respective groups and the subgroups of remaining formations. Overlaying the original vegetation level, a second pattern layer indicates the existence of anthropogenic impact, represented by secondary vegetation, reforestation, pasture and agricultural tracts of short and long cycle.” Instituto Brasileiro de Geografia e Estatística, Mapas de Vegetação do Brasil 2004. Fundação SOS Mata Atlântica, Atlas dos Remanescentes Florestais 2005-2008. Auguste de Saint-Hilaire, Viagem às Nascentes do Rio São Francisco e pela Província de Goyaz, 115-147. This is also true for contemporary small farmers as some studies of slash-and-burn agriculture seems to indicate. Arild Angelsen, “Shifting Cultivation and ‘Deforestation’”; Timo Myllyntaus, et al, “Sustainability in Danger?”; Lucia Chamlian Munari, Memória Social e Ecologia Histórica. See Hal Langfur, The Forbidden Lands.